This beautiful Chime KP Doorknob Traditional Lock Chime from the Karen Penner collection is designed in the style of a beautiful antique doorplate. The steel-colored polyresin doorplate is two-sided and features a keyhole and clear, faceted doorknob on each side. Six tubes sound a beautiful chime at the touch of a gentle wind. Wind Chime Length: The length of a wind chime is measured by the overall length of the chime (not tube length)- hanging hook to the end of the sail. 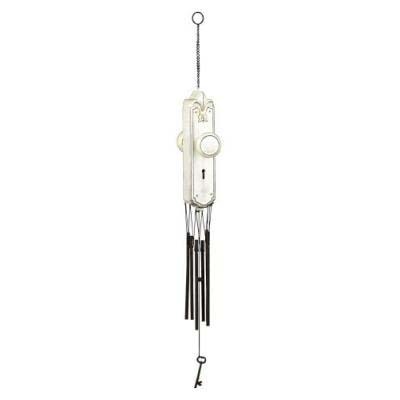 This wind chime is 20 inches long overall.